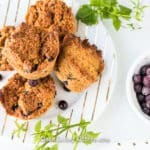 These Air-Fryer Mini Blueberry Muffins only take 10 minutes to bake. They’re gluten-free and so delicious for a healthy breakfast or snack! Spray a silicone muffin pan with non-stick cooking oil and set aside. Combine the frozen blueberries, cassava flour, coconut sugar, salt, and baking powder in a large mixing bowl. Stir to combine. Next, combine the applesauce, egg, ghee, vanilla extract, and unsweetened almond milk in a small mixing bowl and stir to combine. Use a tablespoon to fill the muffin wells ¾ of the way full. Place the muffin pan on the tray of your air-fryer. Set the temperature to 360 degrees for 10 minutes. When the cooking time is up, remove the muffin tin and transfer the muffins to a cooling rack. Next, use your spoon to divide the rest of the batter into the muffin pan and repeat the baking process. Serve warm, and refrigerate or freeze any leftover muffins. Oven directions: bake the muffins at 350 degrees for 15-20 minutes, or until the tops are golden-brown.